16. The “Commando” fighting knife. a. The history of the “Fairbairn-Sykes Fighting knife. 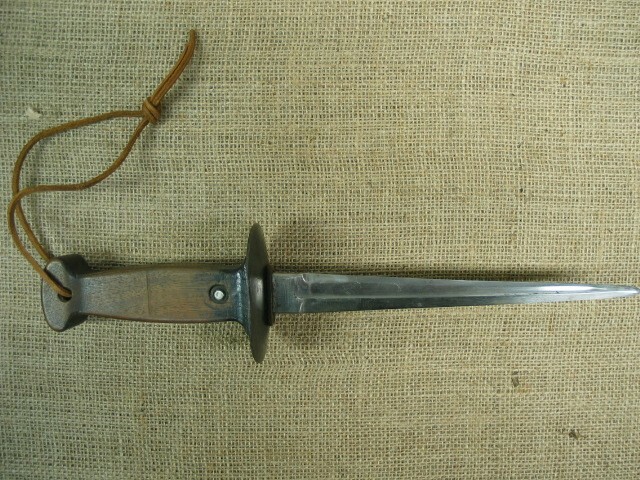 In order to appreciate the complete history of the F-S fighting knife, which was given to the Commandos during World War II, we must go back in time, notably to Shangai in China. There, William Edward Fairbairn and his friend Eric Anthony Sykes trained and led the sections of the Shangai Municipal Police Force, among others the riot squad and the sharpshooter units which belonged to the corps. These units were essential in the fight against criminality in this agitated town – Shangai was known as the most dangerous town in the world, where armed attacks, murders, exactions, kidnappings, seizures of hostages and riots occurred every day. Fairbairn joined the Shangai police in 1907 after serving some time in the “Royal Marines”. As his talent for this kind of job was recognised after a short time, he was rapidly promoted and finally became an assistant police superintendent in 1935. He got a pension in 1940, a short time before the World War broke out. In 1910, Fairbairn has been appointed as a shooting and drill trainer. Until his retirement, he led and continuously improved the methods the Police Corps used to fight criminality. They comprised fighting without arms, self-defence with truncheon, knife and pistol. During all that time, he had taken part in more than 200 skirmishes with criminals. This was surely a good way to improve the fighting methods he had to teach the officers under his command. First, he improved a system of more realistic shooting exercises. Instead of shooting at fixed targets as it was the compulsory custom at the time, he introduced a method of shooting at moving targets. About 1920, he met Eric Sykes. They formed a close team which proved to be very efficient for the war department 20 years later. They taught how to fight hand to hand and use a revolver or a tommy gun. Captain P.N. Walbridge explained the gun and bayonet use. Together with other trainers, they formed a unique team. Soon, commando units appeared but, in the beginning, no fighting knife was provided. At that time, the use of the various types of knives was very limited. 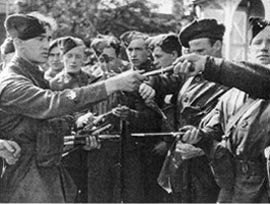 Besides, many commandos had their own weapons, among which some “treasures” dating from World War I.
Fairbairn and Sykes pointed out that if a specific weapon was to be made, it should meet the requirements of the commandos when they would be involved in a hand to hand fight. Their experience gained in Shangai showed that a knife would be made. It would be carried in such a way that the soldiers could use it rapidly and efficiently. Braids were sewn on the sheath so that it could be fixed on the clothes. A heavy handle was required to give the user a firm grip and a certain touch. The point of balance was placed at middle finger height to give the knife accuracy and mobility. The 7 inches blade which was sharpened on both sides enabled the user to cut and thrust while with the point he could strike rapidly and deeply. The steel of the blade was cast up to the pommel of the handle, which was also used to strike. The knife was first intended for “silent killing” or in a hand to hand fight when it was impossible to use a firearm. Some critics did not understand anything about the aim of that weapon. It was ideal for its main use: to kill a sentry. The original project known as the 1st model was made in Sheffield by the world famous firm Wilkinson Co.
Fairbairn and Sykes visited the factory in November 1940 and with John Wilkinson – Latham they perfected the shape which has become so well-known. The first 500 knives were made by hand out of the best black steel. The next model and the third one were mass-produced, as a large number was necessary, but their quality was less good. Many other producers in Sheffield, Birmingham and London joined Wilkinson Co in the production. The knife had a sharp blade of 7 inches, a 5 inch crenellated bronze handle and a S shaped nickel hilt was made. The blade was brilliant. This was made on purpose: when the knife was used, the light reflected on the blade to frighten the enemy, who would lose confidence and surrender. The following models were painted in matt or black varnish to be unnoticed during the night. The first model was produced about January 1941. The knife and the sheath cost 13 shillings and 6 pence (4 € 50). The first knives were probably given to No 3 and No 4 Commandos during the first important Commando operation on the Lofoten islands in Norway. When the landing craft came together in Scapa – Flow, Captains Fairbairn and Sykes visited the Commandos and gave them instructions about the use of the knife. The second model, with another blade to simplify the production was ready in April 1941. The S-shaped hilt was replaced by a straight one. The third model was made in February 1943 in black with a ribbed handle, out of cheap material. The knife is world-famous and has become the symbol of many special troops and can be seen on their badges. The knife is as unique as the first men who used it in fighting. 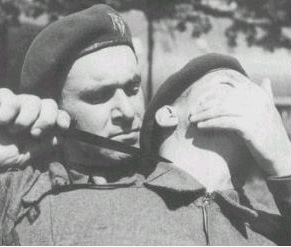 The first commandos, as their knife, were very exceptional. These knives were used in battle by units of many nations among which the British army, the marine commandos, the 10th Interallied commando, the British and Canadian Parachutists, the Special Operations Executive, the Strategic Services Bureau, the Home Guard auxiliary units, the S.A.S., the long range desert patrol, the Chindits, the American Rangers, the Marauders, and even the Ghurka units. Where it was carried and used, it caused fright and terror among the enemies while it brought courage and self-confidence among the users. The knife is now part of the legend of the Allied Forces Commandos and will always be a kind of homage to their feats as well as to its designers William Edward Fairbairn and Eric Anthony Sykes, two particularly gifted men, who in their time were forerunners. b. The personal collection of Alexis Laykoff. Steel blade and handle, handle ornamented with guilloche. (staff and services company 2 Cdo)? The blade and handle seem to be made out of red copper. The handle is marked with a diamond and a Lorraine cross inside. According to various sources, these knives were dropped to the French Resistance. Three knives of this kind are known in other collections. When they went out, the military (UK) who had got the means carried a polished up knife (fancy), a personal weapon without mark. Original fastening of the blade with a 6-sides bolt. Same model as number 6 with a mark on the handle. "↑2"
The daggers used in our units show a hole in their hilts to fasten a chain, as it is fixed on the sheath, it is impossible to lose the weapon. The blade shows a plane surface going almost up to the point, which gives to the weapon a 3-faceted appearance. Because of the events of 1960, several daggers have gone out of use. In 1993, a very large number of these daggers produced for Africa were to be seen in collections’ exchanges. Mark on the handle "2 raised keys". Black handle, gilded hilt made out of brass-chromium-plated blade. Model made as a souvenir of the Falklands Campaign. Mark on the blade : "IN HONOUR OF THE FALKLANDS CAMPAIGN APRIL 10 JUNE 1982"
Mark on the blade: "
TO COMMEMORATE THE 50th ANNIVERSARY OF WORLD WAR II 1939 TO 1945"
Same model as series No 7, except the fastening of the blade on the hilt. On the hilt, mark : "↑ W.D"
Model made by J. Nowill & Sons Est 1700 Sheffield England. Same model as series No 17, but seen from the other side. On this side: "THE PERFORMED WHATSOEVER THEY KING COMMANDED""WHEN SHALL THEIR GLORY FADE". c. Evolution in the course of time. It is also necessary to know that the prototype of the dagger was made from the LEE-METFORD bayonet (1888) in Great-Britain. In a similar way, the trench daggers of the 1914-18 war were made from GREENER bayonets. We find another origin among Mod. 89 Belgian bayonets, picked up on the 1914-18 battlefields, which go to Great-Britain to become trench daggers and come back to the front in 1916. What can we say to explain the whys and therefores about the dagger. When we consult 6 records, we discover 6 different versions… The more we search, the more we flounder. But all your information is welcome. Basis model for designing the Commando dagger. Mark on the Ricasso: "SAYDERSON BROTHL & NEWBOULD SHEFFIELD”. It is not easy to read because of wear. Fastener and handle cut to make a knife. This model is still used for parades among Belgian Commandos. (Note there is no more plane surface). Its is given to Belgian Commandos; it is part of the operational equipment. Dagger of French origin, with a fastener to fix a bayonet, for US-M1 carbine used by Marine Commandos in Algeria. e. The collection of the Commando museum. 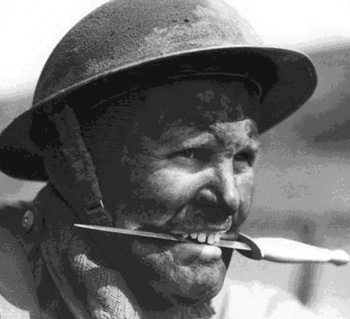 (Model with wooden handle, produced by British companies with the surplus available blades after the end of their official contract with the army). - “Commando Dagger” by Leroy Thompson.